In Hebrews 12 the author starts off by encouraging his readers that faith is a race that we must run on [Heb 12:1], after which he emphasizes the importance of discipline and rationalises God is holy, so God’s people must be holy in motive and in method. If we connect verse 14 to the first few verses of the chapter, we can perhaps conclude that the author is hinting that there is a pursuit of peace and holiness required of each and everyone of us. It is a pursuit, a journey, a race, where we are expected to make every effort in chasing after. In this study, we will explore the idea of peace and holiness being attributes that we need to pursue. Make every effort to live in peace with everyone – When David had to pretend to be insane before Abimelech, he said, turn from evil and do good; seek peace and pursue it [Psa 34:14]. The pursuit of peace is not a new idea that the author of the book of Hebrews introduced. Paul also emphasizes on the pursuit of peace in his letter to Timothy – Flee the evil desires of youth and pursue righteousness, faith, love and peace [2 Tim 2:22]. Paul goes as far as to tell the Romans to, if it is possible, as far as it depends on you, live at peace with everyone [Rom 12:18], and to make every effort to do what leads to peace and to mutual edification [Rom 14:19]. Why, though, why? Why the constant emphasis on the pursuit of peace? We all know Isaiah 9:6[Article] – Jesus is the Prince of Peace; it is through him that we have our peace [Rom 5:1], and in fact, he himself is our peace [Eph 2:14] – he said, Peace I leave with you; my peace I give you [John 14:27]. Peace is a fruit of the Spirit [Gal 5:22]; and our God is a God not of disorder but of peace [1 Cor 14:33], and the peace that can be found in him is a peace that transcends all understanding [Phil 4:7|Article]. What, though, it this peace? The biblical peace is sophisticated. The Hebrew word ‘Shalom’ doesn’t just mean what we know in English to be peace. When you tell somebody shalom, it doesn’t mean that you hope he or she will stay free from trouble – that’s the human concept of peace, isn’t it? Where there are no storms and tribulations, no wars and unrest, no strife and strikes. Shalom really means that all good things will come for you – be it in health or wealth, in spirit or in body. Everything. Effectively, it doesn’t simply mean to avoid trouble. When we say to make every effort to live in peace with everyone – certainly, do everything to ensure you won’t be in trouble with anybody, but secondly, also to do everything to ensure that there is a good relationship, a Shalom relationship, a healthy relationship. It is easy enough to avoid getting into trouble with people – avoidance is easy, even if at times humbling. But to pursue a good, shalom relationship with everyone – let me quote Paul again that it is ‘as far as depends on you‘ [Rom 12:18], for we know that it clearly takes two hands to clap – this is far from easy, and double the humility and love is required. It depends not on external circumstances. It starts from our own attitudes. Perhaps the very first thing we need to do in order to live in peace with men is to first be at peace with God – When the Lord takes pleasure in anyone’s way, he causes their enemies to make peace with them [Prov 16:7]. and to be holy; without holiness no one will see the Lord – holiness is a very divine concept which most of us do not dare to easily take upon ourselves. We tend to think of God as holy, easily enough. After all, God is God, and if he isn’t holy, what is he? But it feels shameless for us to declare ourselves as holy – we feel unworthy and too tainted with sin to ever truly declare ourselves to be holy. It is an awkward adjective to use on ourselves, and even when we use it on other people, we are stingy with it, and not without good reason. But just as he who called you is holy, so be holy in all you do; for it is written: “Be holy, because I am holy. [1 Peter 1:15-16] It is quite simple. Why should we be holy – because God is holy, and we are made in his likeness. I often express it this way – I find it hard to be able to draw close to God if I am not sanctified before him – not that it is hard, really, but just the idea of anything unholy surviving the holiness and presence of God alone is hard to imagine for me. I am the Lord your God; consecrate yourselves and be holy, because I am holy. Do not make yourselves unclean by any creature that moves along the ground. I am the Lord, who brought you up out of Egypt to be your God; therefore be holy, because I am holy [Lev 11:44-45]. 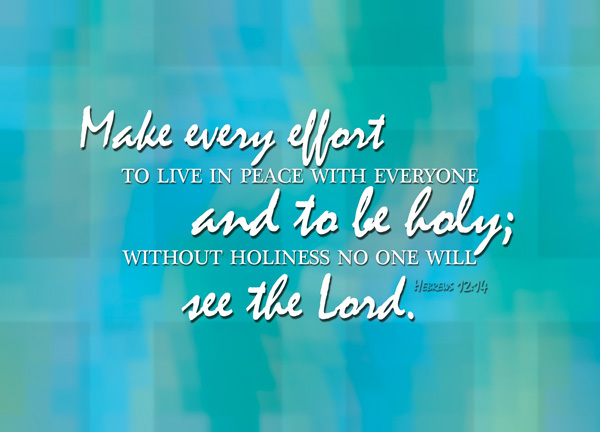 We’re charged to pursue peace and holiness. We are charged to make every effort, to do everything we can, to do the best we can, in order to pursue peace – with God and with people – and holiness in the likeness of the Lord. How well are we doing in this pursuit of ours? Or are we blindly pursuing other things that we have forgotten to chase after what’s most important instead? As we go on this journey, let us help one another out and be careful of all the roadblocks and pitfalls that may potentially stumble us. After all, if we can just see the Lord, I’m sure we will find him sweeter than honey, than honey from the honeycomb [Psa 19:10].